At Elite Performance Automotive the nature of our business is to provide quality automotive repair and mechanic expertise that is both knowledgeable and trustworthy. Our number one goal is always to put quality first, never compromising on what is the right repair, and doing so at the most cost-effective price for our customers, while excelling at all aspects of automotive maintenance and repair. We strive to meet your needs of a reliable and professional automotive shop that can repair, maintain, and even customize and enhance your vehicle’s performance while always putting customer satisfaction first. We rely on the quality of our work and on customer feedback. We promise honesty to our customers, and we excel due to our knowledge and talent in the automotive field. If you don't want to hear it from us, just ask our customers! We also aim to serve the growing market of automotive enthusiasts who strive to put power and personalization into their vehicles alongside their routine maintenance and repairs--customizing their cars in every aspect from stereo systems to engine modifications, exhaust upgrades and air intakes. Be sure to pet the shop dog when you're there! 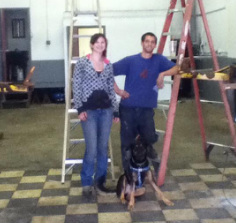 Ammo is a rescued and well-loved pup who found his home with business partners Johnny and Abby. He enjoys retrieving, running, eating treats, and receiving a nice belly rub.